There are many traditions when it comes to ringing in the New Year: The New York City Ball Drop. Fabulous firework shows all around the world. Attending local events. Or, if you so choose too, relaxing from the comfort of our own home. This year my husband and I decided we wanted to do something unique. Something that would be a topic of conversations with our friends in Philadelphia. To celebrate the end of 2107 and the birth of 2018, we decided to travel to the warmth of Arizona to witness a truly unique way of celebrating the new year. 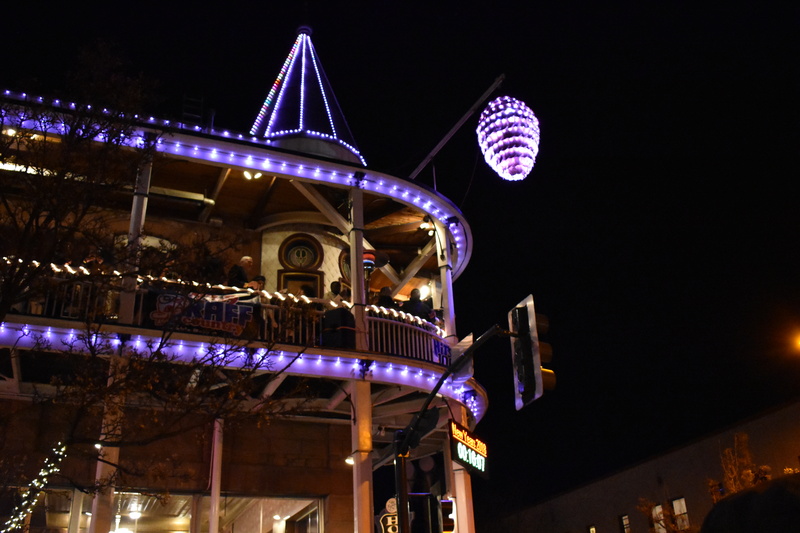 Every December 31st, locals and tourist gather around Aspen Avenue and Leroux Streets in downtown Flagstaff to celebrate the New Year together. On the surface, it looks like every other city in the world celebrating: outdoor boutique shopping, dining at delicious restaurants, taking in the local history, drinking at local pubs and people sharing a few laughs with friends and family. However, this NYE experience is quite different. Introducing the Great Pine Cone Drop! First, a bit of history. The first pine cone drop took place in 1999 to celebrate the Weatherford Hotel’s 100 anniversary. The original pine cone was a large green trashcan covered in real pine cones that was spray painted and weighted down with sand. It hung atop the roof outside the historic Hotel Weatherford (which is in the heart of downtown Flagstaff) and from what my grandmother told me, people would lower it down by hand when the clock struck midnight. Everyone gathered around and, of course, bundled up as the temperatures dropped below 20 degrees. With the attraction growing over the years, the quality of the giant pine cone got better and the tradition continued. As midnight approached, we parked our car near the train station and muscled our way through the 2,000 plus people in order to find a perfect spot to see both the pine cone drop and the firework show. As we got to our spot on the street, there it was: the magnificent Weatherford Hotel, lights glistening bright, and a giant pine cone hanging from the roof…in all its glory. Not only it is a sight to see, but you feel the magic of the arrival of the New Year with a digital countdown that ticks away right below the pine cone. I tried to take in everything that was happening around me however, I couldn’t stop staring at this manmade pine cone illuminating brightly with changing LED lights queued to music. I caught myself giggling more on the fact of how this is a thing. I mean it’s a six-foot aluminum pine cone being dropped. But let me tell you, this is a once in a lifetime event that you have to experience at least once. I loved every minute of it! I am a big city girl but ringing in the New Year with my husband and grandmother in a small town while experiencing this tradition was unforgettable. New York has the colorful crystal, Flagstaff has a colorful pine cone. Got to love it! I am truly looking forward to a magnificent 2018. Happy New Year’s everyone! Do you have any unique NYE traditions or experiences? Please share!